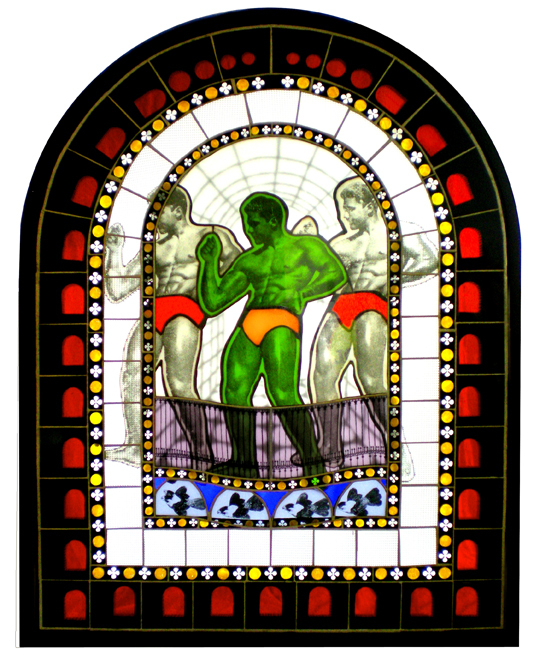 Taking inspiration from pop culture, New York native Joseph Cavalieri has reinvented painted stained glass as an expression of a personal vision. Coming from a graphic design background, he began to pursue a passion for glass art in 2008 and has recently completed residencies and artist lectures in Australia and Thailand. Cavalieri currently teaches at UrbanGlass in Brooklyn, New York. He is represented by Duane Reed Gallery. 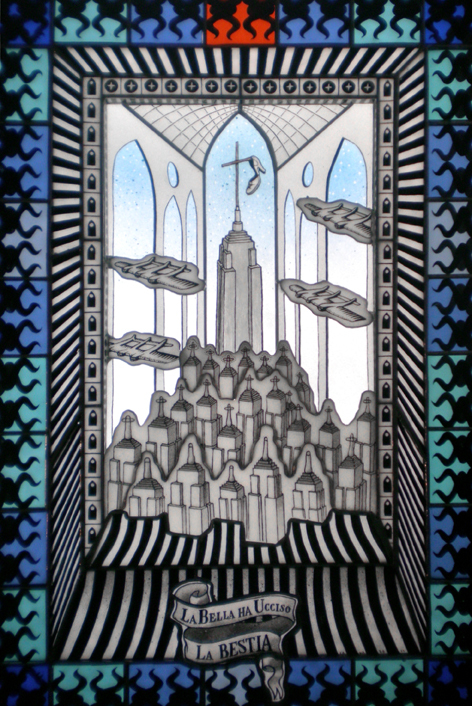 You could call me a "glass missionary" with an agenda to widen the perception of traditional painted stained glass. 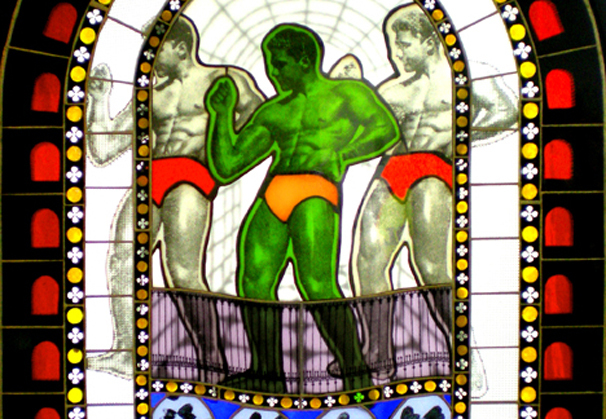 I often tell people my mission in life is to take stained glass out of the church and into the public. 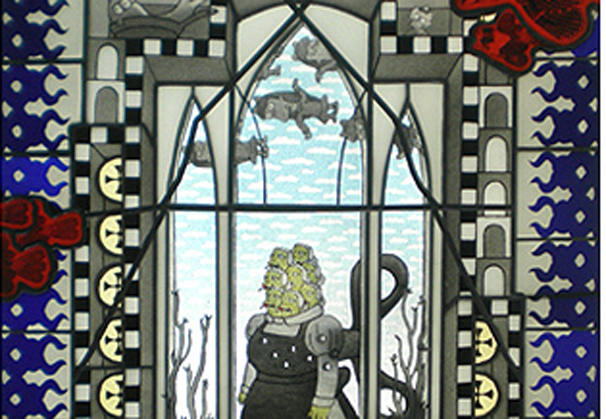 To date I’ve created 15 works based on the Simpsons and R. Crumb, some very non-traditional subjects in stained glass. It’s obvious that my work includes humor, but more importantly each piece I make has a challenge. My background is in graphic design, working as art director in magazines in Manhattan including GQ, People and Good Housekeeping. 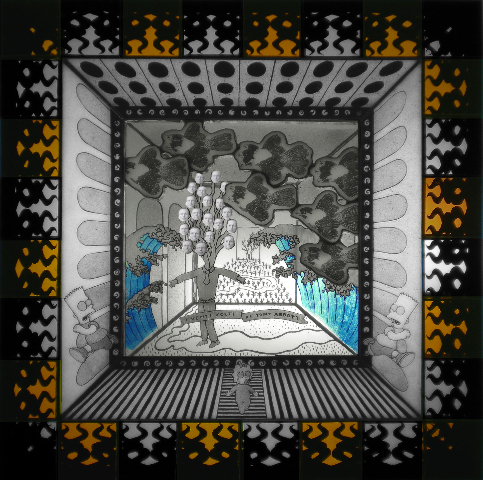 I consider my glass art to be visual layouts, and plan how an individual will view the work. I think about the color, size and placement of the images, and arrange these so the sequence will draw the viewer deep inside the work, where they will ponder the meaning of the story. I explore form, space and perspective using techniques of fired and layered painted glass that dates back to Medieval times. My work includes technical challenges like hand painting 25 Empire State Buildings, 13 Krusty the Clowns, and a 17 headed Moe. 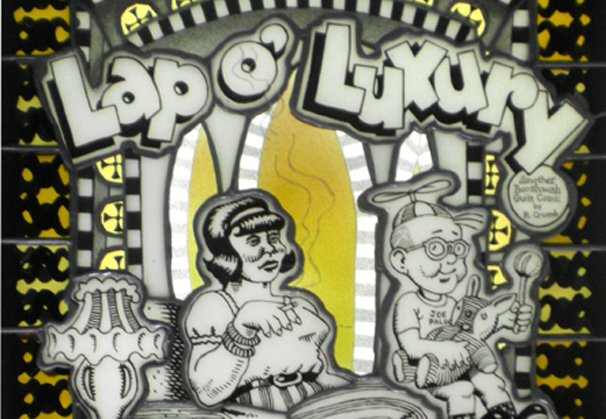 Currently I am working on works of historic engravings. 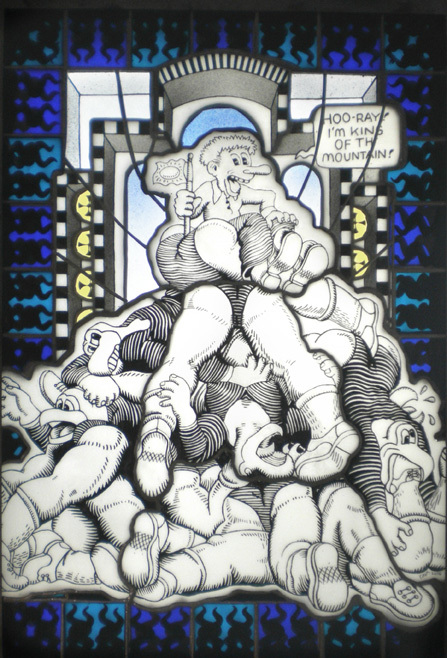 I have been working in painted stained glass since 1997. 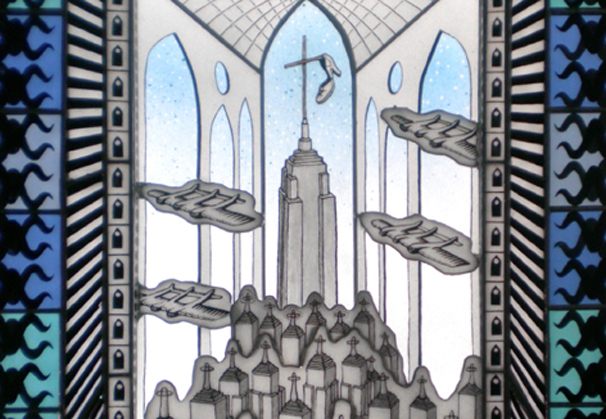 In 2009 I opened my glass studio in downtown New York. 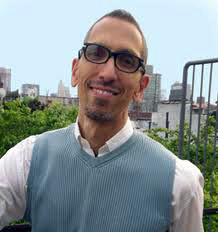 Joseph Cavalieri’s award-winning work has been exhibited at art galleries and museums in the U.S., Europe, India and Australia, including the Museum of Arts and Design in New York and the Leslie/Lohman Gay Art Foundation in Manhattan (permanent collection). 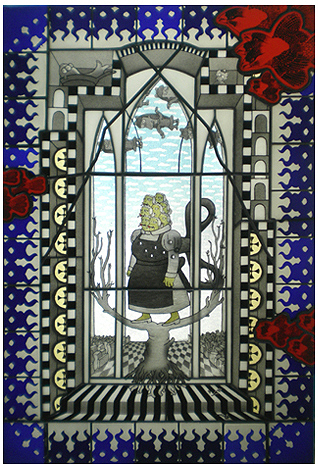 Using techniques of fired and layered painted glass, Cavalieri may be best known for his “Simpson” and “Cavalieri & Crumb” series. 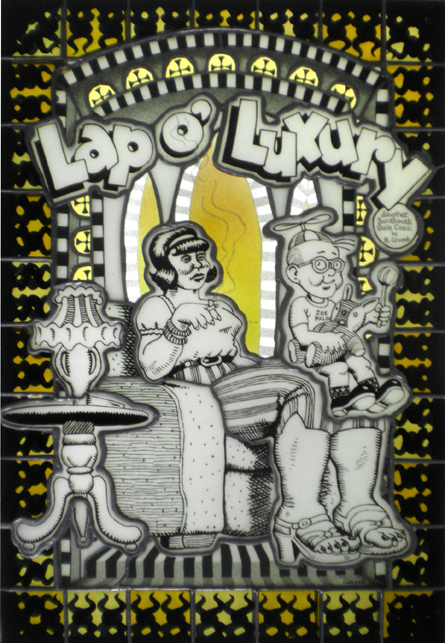 In the “Cavalieri and Crumb” series, Joseph assimilated animation cult hero R. Crumb’s iconic images with medieval stained glass settings. The first pieces were produced during Cavalieri’s three month residency at the Museum of Arts and Design. Two works of Cavalieri’s based on the long-running animated television show, The Simpsons, were bought by Simpsons writers, and another of his panels hangs in the Los Angeles offices where the series is written. Morgan Spurlock (“Super Size Me” director) chose to show Cavalieri’s work in his “Simpsons 20th Anniversary Special,” and has one piece in his private collection. Cavalieri’s work, I Venti Volti Di Tony Abbott (Twenty Faces of Tony Abbott), was created during Cavalieri’s research residency at Sydney College of the Arts, where he was inspired by views of students in the glass program. He is currently working on images of historic engravings such as that of King Henri III of France (1551-1589) who was the son of King Henry II and Catherine de Medici. 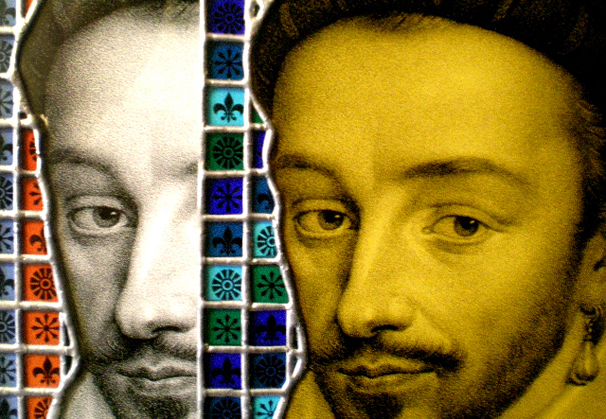 It has long been claimed and often disputed the Henri was homosexual or at least bisexual. 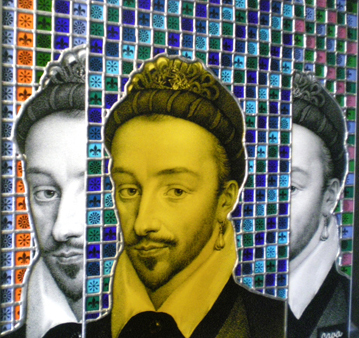 Cavalieri’s portrait interprets the multiple sides of Henri’s personality, as well as form, space and color patterns. 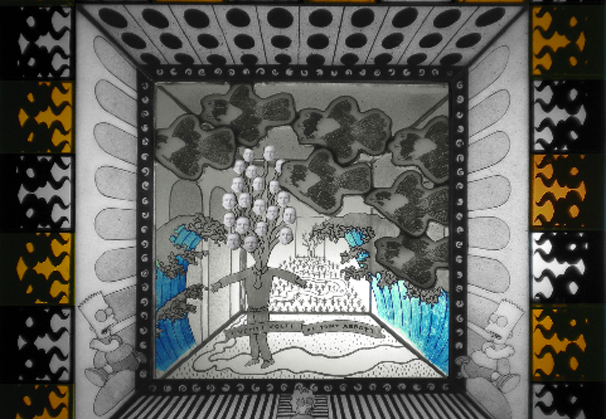 Joseph’s public art can be seen at Dixon Place Theater in Manhattan, at New York’s MTA Philipse Manor Train Station in Sleepy Hollow, New York, and internationally at the Sanskriti Foundation in Delhi, India, and North Lands Creative Glass, in Scotland. Born and raised in Pleasantville, New York, Cavalieri attended the School of Visual Arts in Manhattan, after which he worked as an art directed at GQ, People and Good Housekeeping magazines. In 1997 he began studies at UrbanGlass in Brooklyn (where he currently teaches) leading to working full time in 2009 out of his Manhattan studio.